Bartonella is bacteria that are found in many animals including Beluga whales, horses, cattle, sheep, deer, rodents, dogs, cats and people. It is transmitted between animals by fleas, ticks, and sand flies. Bartonella can cause long-lasting infections and chronic inflammatory diseases in cats, dogs and people. Human Bartonella diseases are mainly caused by infections from cats. The most well-known disease is Cat Scratch Disease. 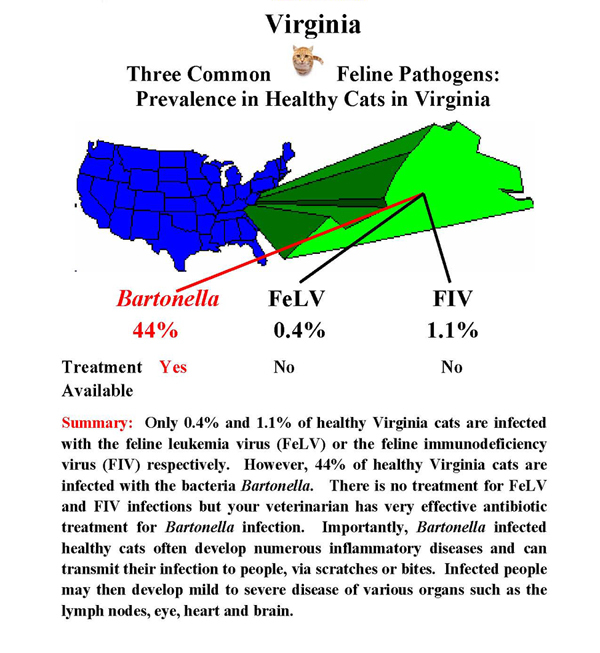 Cats: there are 80 million pet cats in the country and about one-third are infected chronic carriers of Bartonella. Cats infect people via scratches, bites or contact. Playful kittens, under one year of age, are most likely to infect people. Immunosuppressed people- cancer patients, transplant recipients and the elderly over 65 are more susceptible to develop severe Bartonella diseases. Birdneck Animal Hospital can test your cat, at any age, for Bartonella infection by a simple blood test. Treatment: Bartonella infected cats can be successfully treated with antibiotics to eliminate their infection and render them safe pets. Information is power: ask your veterinarian about Bartonella or download a brochure here.